4-H Fair Kicks Off Friday! 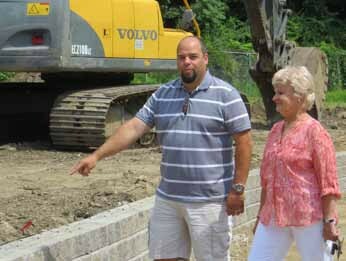 Brewster Village Trustees Tom Boissonnault and Mary Bryde visit Wells Park last week to check on its progress. Brewster’s late Mayor John Cesar often talked about the “rebirth and renaissance of the Hub of the Harlem Valley.” That … Please login below or purchase a subscription to the Putnam County Courier to access this content. 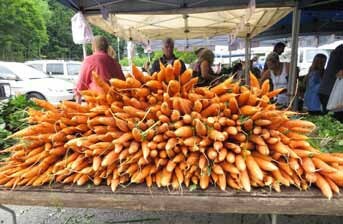 Nothing like “fresh!” These carrots were picked in Orange County hours before they were trucked to Brewster for sale. A sign of summer has returned to Putnam County. The Brewster Farmers Market is open for the season featuring a wide vari… Please login below or purchase a subscription to the Putnam County Courier to access this content. Teacher Liz Sant works with students Kyle Gannon and Lucas Granados during the unique summer school experience last week. An online system called Edgenuity is giving students at Brewster High School a second chance. The summer school initiative is ta… Please login below or purchase a subscription to the Putnam County Courier to access this content. 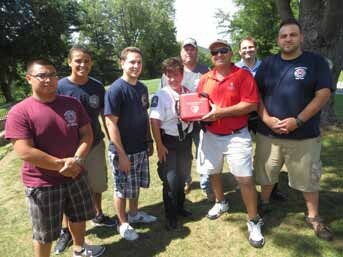 Putnam’s heroes returned to the Putnam County Golf Course Wednesday afternoon to reflect on their lifesaving technique that brought a New Jersey man back from the dead. A New Jersey man is alive thanks to the professionalism and training of eme… Please login below or purchase a subscription to the Putnam County Courier to access this content. 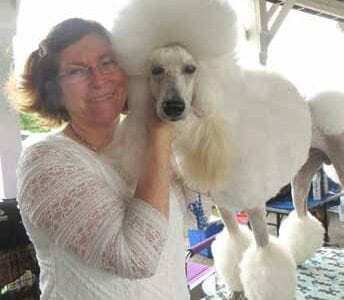 Grace Durkin of Brewster and her champion Standard Poodle “Bernie” get ready for the competition. Left: Nanette Prideux’s 5 year old Beagle “Taffy.” The Putnam Veterans Memorial Park became a haven for dogs last weekend … Please login below or purchase a subscription to the Putnam County Courier to access this content. “When fulfilled people die, the essential oil of their experience enters, the veins of living space” So goes the namesake poem of James Crafford’s new play “When the Ripe Fruit Falls”. This will be Crafford’s nint… Please login below or purchase a subscription to the Putnam County Courier to access this content. The immortal songs of rock ’n’ roll’s patron saint will be performed in all their glory July 25-Aug. 1 as Yorktown Stage presents the Broadway show All Shook Up: The Music of Elvis Presley. The tuneful production, which was on Broa… Please login below or purchase a subscription to the Putnam County Courier to access this content. A walking tour this weekend in Brewster will cover key historical sites. Here are the details: Sunday July 26, 2015 1:00PM Meet at 67 Main Street, Brewster Tours will start at the Southeast Museum. Tickets: $5/person. Children under 6 are free. Pay… Please login below or purchase a subscription to the Putnam County Courier to access this content.